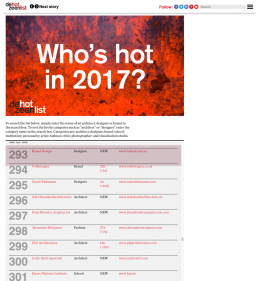 Very excited Biasol is ranked #293 on the Dezeen Hot List — Top 500 people, brands and organisations Dezeen readers wanted to read most about this year. [Extract] Dezeen Hot list is compiled by analysing every single visit to www.dezeen.com and every single search term to identity the topics that are most popular with readers. You can read about the methodology here. To create the 2017 list, we looked at audience data from 1 July 2016 to 30 June 2017. Huge thanks to Peter Hedley, Jack Young and Oli Osborne for helping with the data crunching; the algorithm they wrote allowed us to considerably speed up the process. Last year’s inaugural Dezeen List List was described as a “game changer” by the British Society of Magazine Editors, who awarded Dezeen’s Olivia Mull the award for Best Digital Content Idea at the BSME Talent Awards in June this year.